This morning (Friday 31st July 2015) I headed out to the Cromer Conservation Park, which is located about 5 km north of Birdwood in the Mount Lofty Ranges. It is about a 30 minute drive from home, through the Adelaide Hills. 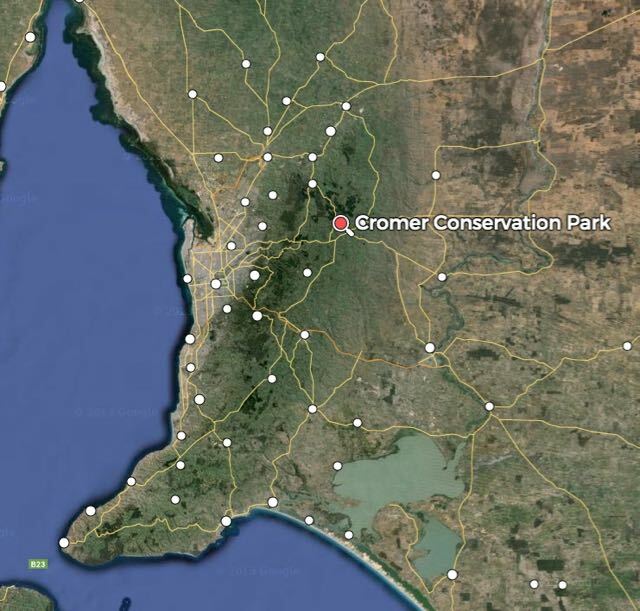 I had activated Cromer previously as part of the VK5 National and Conservation Parks Award, but this was my first time in the park as part of the World Wide Flora Fauna (WWFF) program. Cromer had been allocated a VKFF number in March this year. 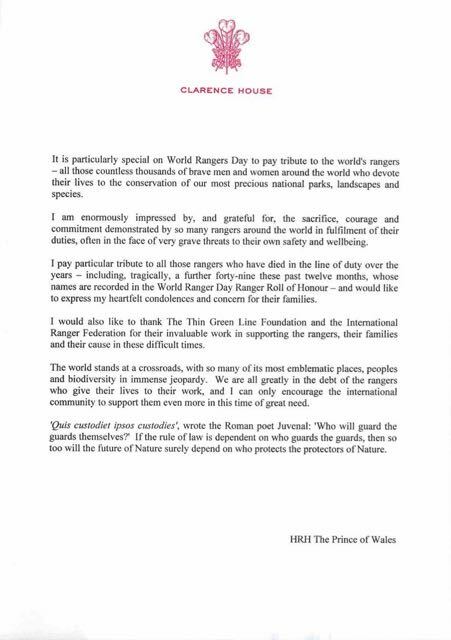 And today was also World Ranger Day. World Ranger Day, which is observed annually on the 31st of July, commemorates rangers killed or injured in the line of duty, and celebrates the work rangers do to protect the world’s natural and cultural treasures. For more information, please see….. It was a freezing morning, with the Adelaide Hills having had another very cold night and a morning frost. I was on a day off from work, and had slept in a bit, so it was just after 8.00 a.m. by the time I hit the road. I had to use a bucket of water to get the ice off the windscreen of the Toyota Hi Lux. Generally the temperature gauge is accurate, and it was showing 0 degrees C.
I travelled out through Nairne, to Woodside and then on to the little town of Mount Torrens. I continued north to Birdwood which is the home of the National Motor Museum. From Birdwood I travelled north on the Cromer Road which starts off as bitumen, but soon changes to dirt. The park is located about 5 km out of Birdwood and is well signposted. The Mount Crawford Forest borders the park and this part of the northern Mount Lofty Ranges is very picturesque. 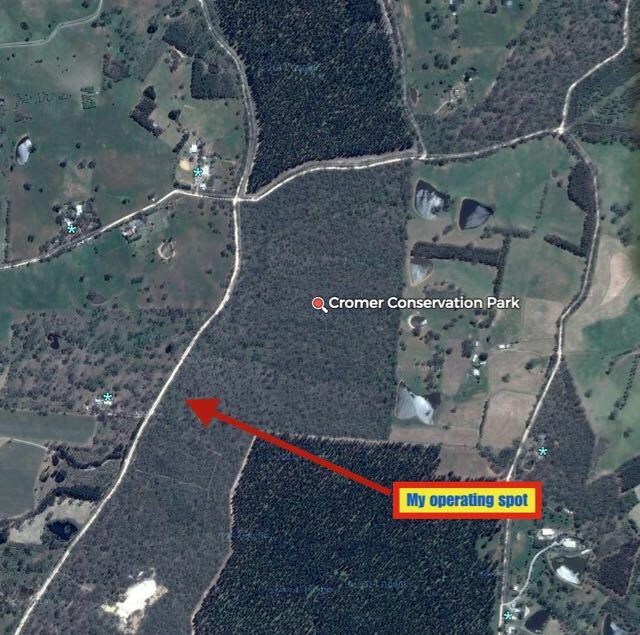 Cromer CP is 50 hectares in size and represents one of the largest contiguous native remnant vegetation parcels within the Upper Torrens catchment area in the Mount Lofty Ranges. The park was declared in 1976. It provides significant habitat for a variety of flora and fauna. There were quite a few Western Grey kangaroos on the road, braving the morning cold. And sadly I found a young female kangaroo (doe), dead on the side of the road, not far from the park entry on Cromer Road. And deceased alongside of her was her young joey which was probably only a few months old. Obviously she had been hit by a passing vehicle. Not the most pleasing start to the activation. I set up my fold up table and deck chair just inside the park entry on Cromer Road. For this activation I used my normal portable equipment consisting of the Yaesu FT-857d, and my 40m/20m linked dipole, supported on the 7 metre telescopic squid pole. I tied off the ends of the dipole to some gum trees in the parks, so the ends of the legs were about 4 -5 feet off the ground. I headed to 7.144 which I had nominated as my operating frequency, and asked if the frequency was in use. This was immediately answered by Greg VK5GJ at Meadows, in the southern Mount Lofty Ranges. Greg was running just 4 watts, but still had a good 5/7 signal to Cromer. Greg kindly spotted me on parksnpeaks. Next caller was John VK5BJE at Scott Creek with a nice 5/9 signal, who also spotted me on parksnpeaks. This was followed by Tony VK5FTVR at Strathalbyn who was very strong. I worked a total of 12 stations before the UTC rollover, in VK1, VK2, VK3, VK5, & VK6. This included a call from Julie VK3FOWL who was at a school at Ormond in Victoria. Julie conducts amateur radio classes at schools, and asked if she could call back a bit later with some of the students. Of course, I agree, as anything to promote the hobby is a great thing. And Julie and her hubby zJoe VK3YSP certainly do a lot to promote the hobby. After the UTC rollover I worked a further 5 stations in VK2, VK4, & VK5, before heading off to 20m. On 20m I called CQ on 14.244 and this was answered by George VK4GSF at Toowoomba with a good strong 5/9 signal. This was followed by Greg VK5GJ, who although very weak, was very readable. Again, Greg spotted me on parksnpeaks. Spotting is very much appreciated, as it not only helps the activator, but also helps the park hunters. Next up was another Queenslander. This time, Ron VK4QO with a nice strong 5/9 signal. My next taker was Brian VK5BC who was kind enough to place me on the DX cluster. This clearly resulted in my first DX contact for this activation, Dave YB0AJZ in Jakarta. My laster taker on 20m was Anthony VK6MAC who was portable in the South West of Western Australia. After working a total of 11 stations on 20m in VK2, VK4, VK5, VK6, VK7 and Indonesia, I headed back to 40m and called CQ again on 7.144. This was answered by Col VK5HCF at Mount Gambier. 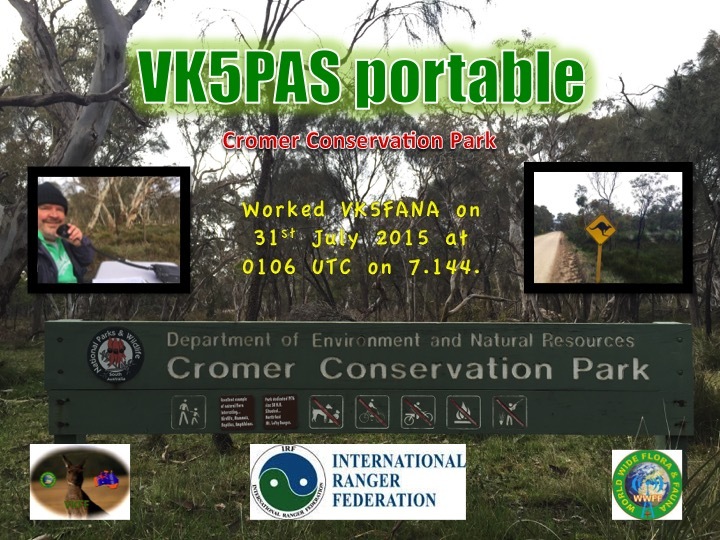 I worked a further 7 stations including Mick VK3PMG who spotted me on parksnpeaks. Shortly after I was called by Julie VK3FOWL. When things slowed down a little, I tuned across the 40m band and found Rob VK2QR calling CQ from SOTA summit, Mount Ikes, VK2/ SW-030. Rob was a very nice 5/9 signal, and is always one of the strongest SOTA activators that I hear on the band. I headed back to 7.144 and called CQ again, where I spoke with Cleeve VK2MOR, who placed me on the DX cluster. This was followed by Rex VK3ARG. But despite a number of CQ calls I had no further callers, so I headed back to 20m for a final listen before going QRT. I headed to 14.244, but found Colin VK4LAC calling CQ on 14.245. I gave Colin a call who had a good 5/9 signal. Colin advised that he was just newly licenced, so I was very pleased to get Colin in the log. Colin kindly left me the frequency and I was then called by Albert S58AL in Slovenia. I was a little surprised to hear Albert as it was very early, only midday local time. So long path to Europe was still opening up. My last taker was Brooke VK4RZ with a 5/9 plus signal. I ended up with a total of 51 contacts in the log for this activation, which I was very pleased with, considering that this was a weekday. As a result of the proposed addition of some more South Australian parks for the World Wide Flora and Fauna (WWFF) program, I decided to review my list and compare it with official information. This is a follow up to an old post back in June 2014. Adelaide and Mount Lofty Ranges. 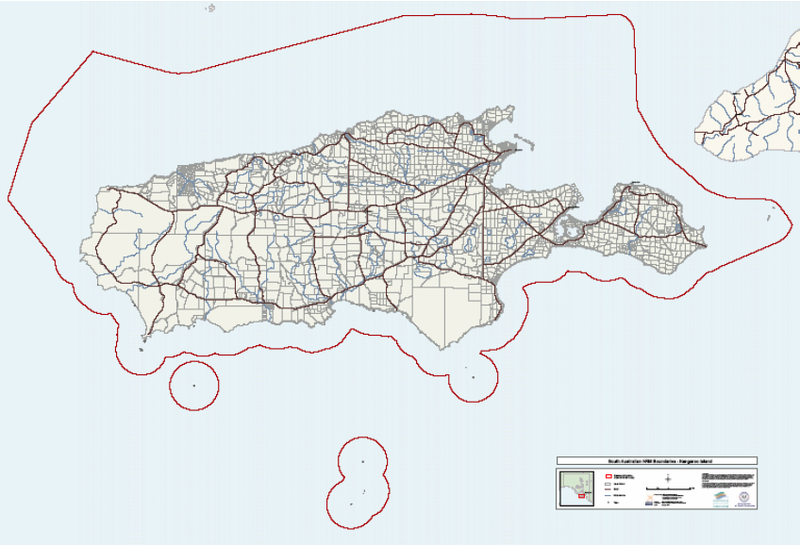 This region’s total area is approximately 11,200 square kilometres. Around 59% of that is land and 41% marine waters. It supports around 1.3 million people which equates to 80 % of South Australia’s population. 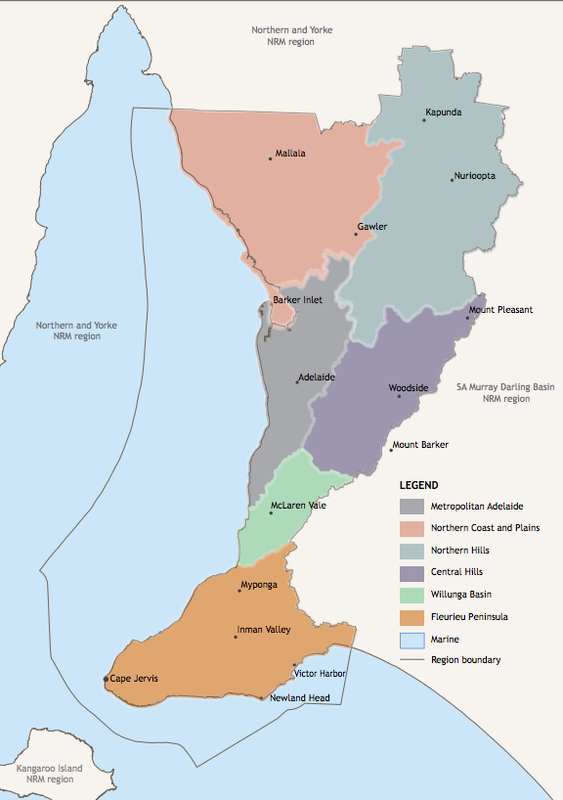 The region includes metropolitanAdelaide and the western side of the Mount Lofty Ranges, extending from Mallala and the Barossa in the north, to the Fleurieu Peninsula in the south. 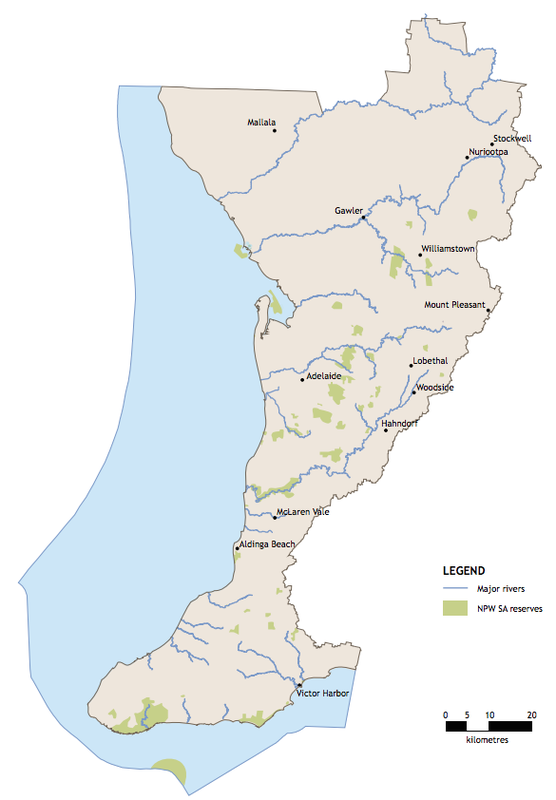 The region also extends up to 30km into the marine environment. The region supports remnant busland, agriculture and horticulture, urban areas, beaches, spectacular coastal scenery and marine environments. For more information please see….. 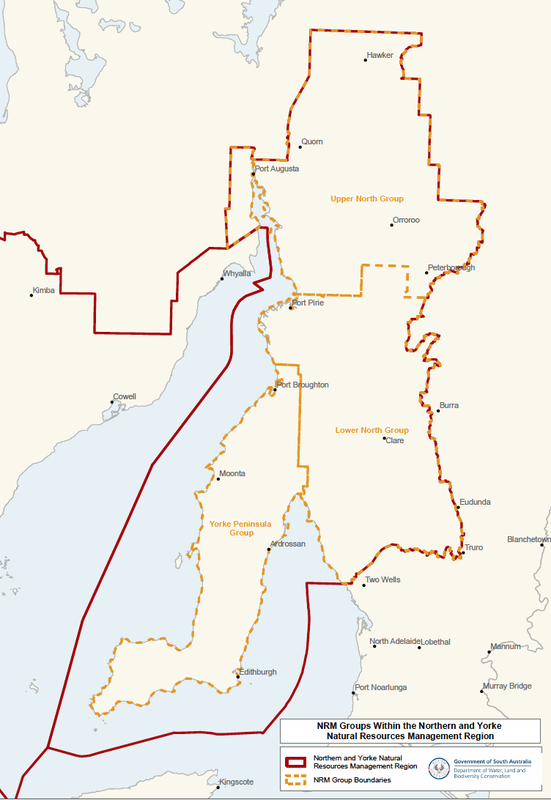 The Alinytjara Wilurara (AW) natural resource management (NRM) region covers the north west third of South Australia. In Pitjantjatjara, ‘alinytjara’ means ‘north’ and ‘wilurara’ means ‘west’. 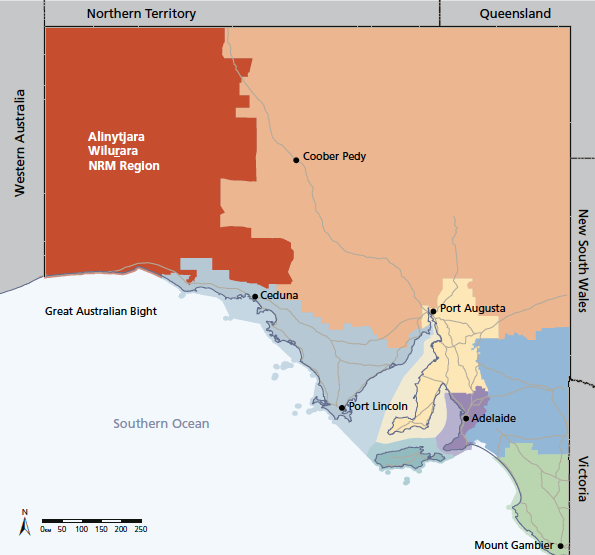 The AW NRM region covers more than 250,000 square kilometres, stretching from the Northern Territory and West Australian borders south to the Great Australian Bight. The regional boundary extends to the edge of the State Waters (three nautical miles off-shore) in the Great Australian Bight and includes the South Australian part of the Great Australian Bight Marine Park. The land and its 340 kilometres of coastline are mostly dedicated to conservation and traditional Aboriginal use and occupation. The homelands and community townships are inhabited by approximately 4,000 people. For more information please see…. 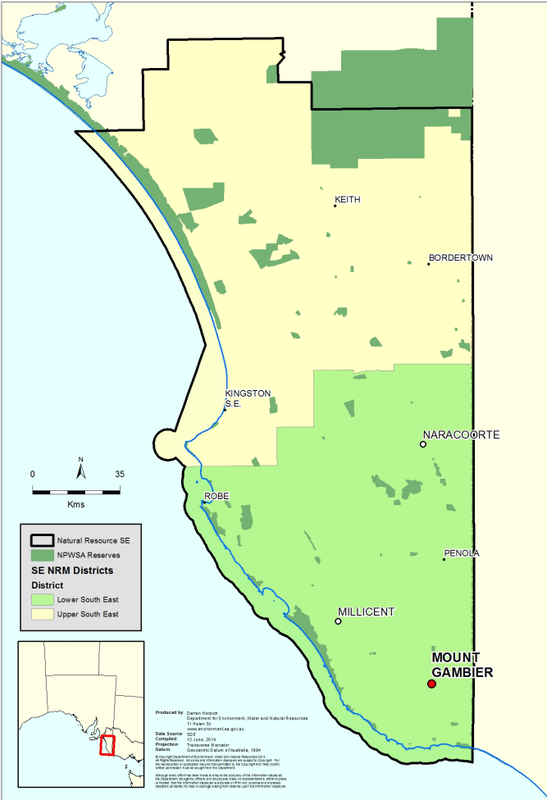 The Eyre Peninsula region covers a significant area of South Australia (80,000 square km / 8 million ha) and includes part of the upper Spencer Gulf, the City of Whyalla, across the southern boundaries of the Gawler Ranges, past Ceduna to the edge of the Nullarbor Plain and south to the fishing hub of Port Lincoln. 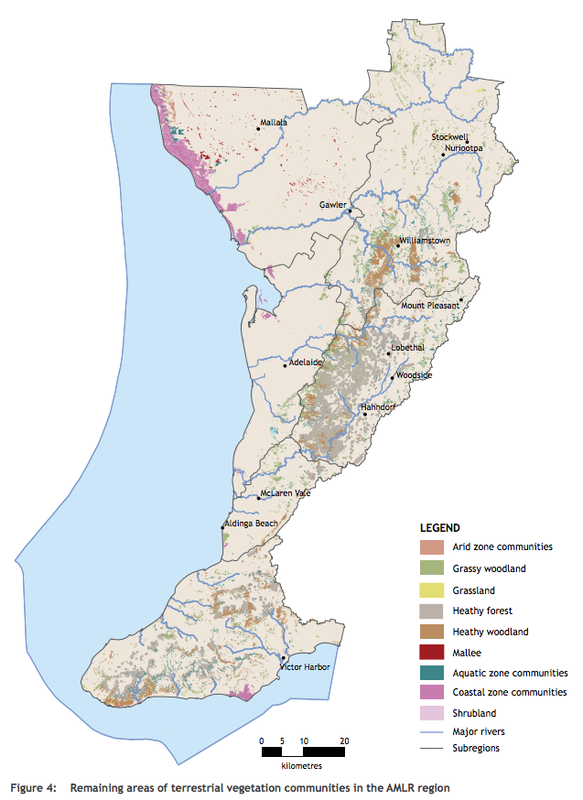 Native vegetation covers about 44% of the land mass. The coastline in this region stretches for about 2,475 km in length. The region supports a population of about 55,000 people. up to 600 species of marine algae. Kangaroo Island has a total of 22 parks, consisting of 1 National Park, and 21 Conservation Parks. The Northern and Yorke (NY) natural resources management region extends for 34,500 square kilometres, or more than three million hectares. 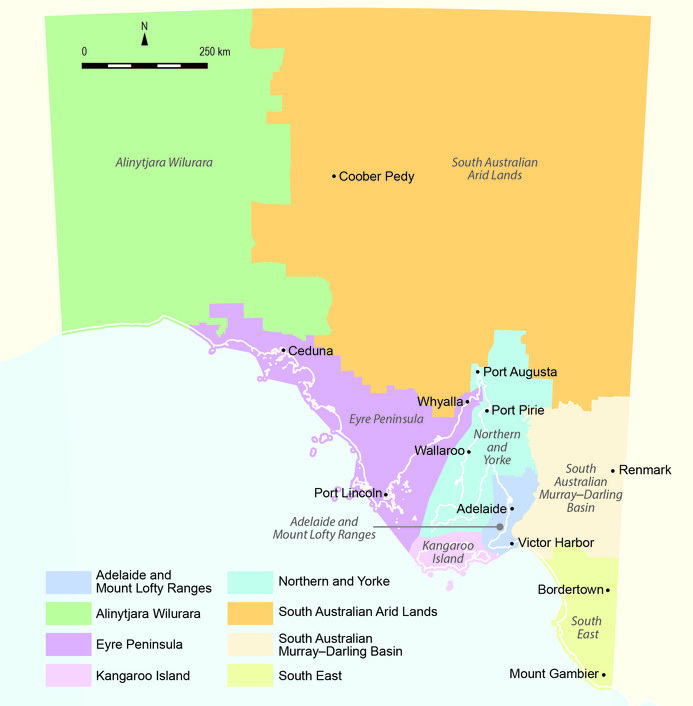 It is a varied and productive portion of South Australia and includes 1,350km of coastline and adjacent marine areas. 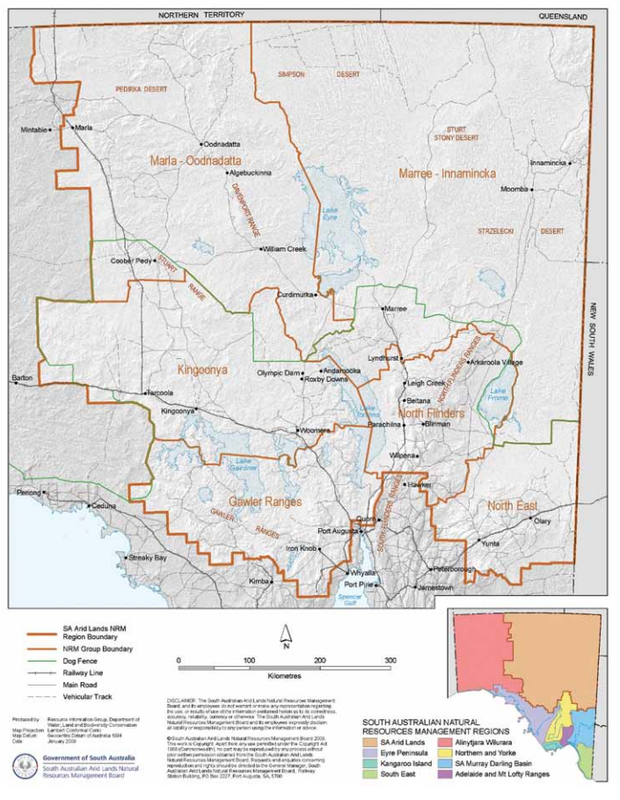 The region encompasses the Yorke Peninsula, the northern Mount Lofty Ranges, the southern Flinders Ranges and significant areas of Spencer Gulf and Gulf St Vincent. The region supports a population of approximately 95,000 people who reside in agricultural, coastal and urban communities. It welcomes a large number of visitors each year to destinations that include Innes National Park, the Clare Valley and the Southern Flinders Ranges. The region includes traditional Aboriginal lands of the Kaurna, Narrunga, Nukunu, Ngadjuri, Meru, Danggali, Barngala and Adnyamathanha people. The major urban centres are the cities of Port Pirie, Port Augusta, Clare, Kadina, Moonta and Wallaroo. Natural resources underpin a range of industries. Approximately 80% of the region is under agricultural cropping and grazing production contributing a quarter of the South Australia’s agricultural earnings. The region embraces the major Clare Valley wine growing area, and supports significant mining and mineral processing activities, fishing, aquaculture, forestry, horticulture and tourism. The SA Arid Lands region cover over half of South Australia, taking up the state’s north-east corner to its borders with New South Wales, Queensland and the Northern Territory. The region’s environmental processes are determined by irregular rainfall and other episodic weather events that rarely follow predictable annual cycles. The region includes some of the driest parts of South Australia and has the largest percentage of intact ecosystems and natural biodiversity in the state. These iconic terrestrial ecosystems – including sandy deserts, stony plains, and the Gawler, Flinders and Olary ranges – are home to a range of unique plants and animals, many of which are only found within the region. The human population in this semi arid region is small (less than 2% of the state) and geographically dispersed. The largest towns, Coober Pedy and Roxby Downs, are both associated with mining and are home to less than 5000 people, while the remaining scattered towns all have less than 1000 occupants. Pastoralism is the most dominant land use, with over 400,000 square kilometres taken up by sheep and cattle stations. Large mining and petroleum companies also operate in the arid lands. Aboriginal land holdings are diverse and include pastoral leases, community managed land, indigenous protected areas and co-managed parks. The region contains some of the state’s most environmentally significant natural resources including conservation reserves and National Parks, as well as two great inland water systems: Kati Thanda – Lake Eyre and the Great Artesian Basin. 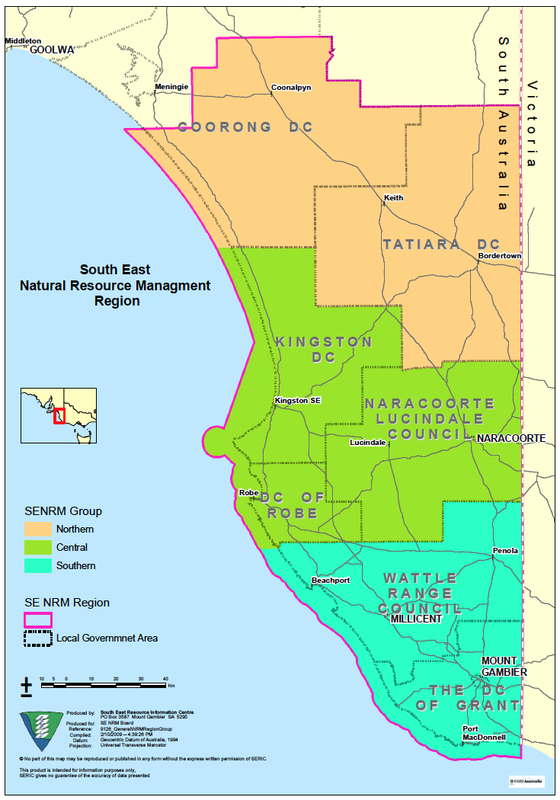 The South East Natural Resources Management (SE NRM) region covers an area of approximately 28,000 square kilometres and is bounded by the Victorian border to the east, the Southern Ocean to the south and the Coorong to the west. This area of South Australia is commonly referred to as the Limestone Coast due to its proximity to the coast and the abundance of limestone located under the soil, which acts as a filter to produce high quality water. The climate of the region is characterised by cool wet winters and mild to hot, dry summers. Average annual rainfall varies considerably within the region, from approximately 850mm in the south to 450mm in the north of the region. With a favourable climate, suitable soils and underground water, the South East has a strong history as a highly productive area that supports a diverse and profitable industry base. The region contributes about $5 billion per annum towards the South Australian GDP with more than 30% of the State’s GDP produced by the South East’s agricultural sector. The key economic activities in the region supported by natural resources include plantation forestry, wine/viticulture, agriculture, dairy, potatoes, fishing/aquaculture and their associated industries. The region is distinguished by a series of stranded dunes that rise between 20-50 metres above interdunal plains. 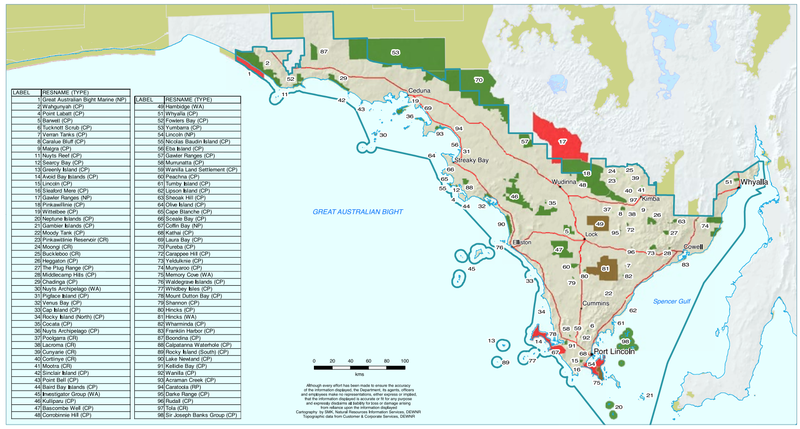 These plains can be inundated over winter and host a variety of internationally-recognised wetland systems, including the Ramsar-listed Bool and Hacks lagoons and part of the Coorong and Lower Lakes Wetlands. The region also hosts and extensive network of limestone sink holes and caves, which include the World Heritage Listed Naracoorte Caves. I recently received an email from the SPFF Award Managers with my certificate for the next level of the SPFF Hunter Award. It was awarded to me for working 18 different SPFF reference areas. And here we go with some of the VKFF Hunter statistics. Remember, that the VKFF program commenced in March 2013. So I have started in that year. In 2013, the Top 5 WWFF Hunters in Australia were myself VK5PAS and Larry VK5LY (tied on 39 different WWFF references), followed by Bernard VK3AMB with 38, then Ron VK3AFW on 37, and then Peter VK3PF on 33. No Australian operators appeared in the Top 44 in the World. The stats there are amazing. Coming in at number 44 in the World was SP5ICQ in Poland, with 655 different WWFF reference areas. Coming in at number one was Luciano I5FLN in Italy, with a staggering 1,360 references. This just goes to show the popularity of the WWFF program in Europe. Of note, all of the Top 44 Hunters in the VKFF list were Australians. 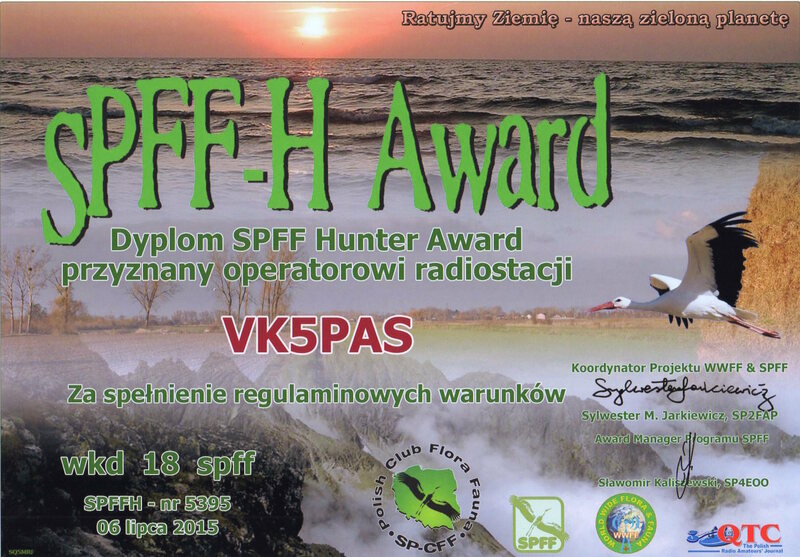 In 2014, Peter VK3PF was the leading WWFF Hunter with a total of 85 different WWFF reference areas, followed by VK5PAS with 83, Amanda VK3FQSO with 81. There was then quite a gap, with number 4 being Matt VK1MA with 62 different WWFF references, and rounding off the Top 5 was Nev VK5WG also with 62. Again, no VK’s in the Top 44 in the World. Luciano I5FLN was at the top again with 1,826 different WWFF references. I just shake my head at that amazing total. At number 44 in the World was SA5BZT in Sweden, with 928 references. Albert S58AL and Luciano I5FLN did sneak into the VKFF list, as the popularity of the VKFF program increased in 2014. So far in 2015, Peter VK3PF is leading with a massive 146 different WWFF references for this year to date, followed by Amanda VK3FQSO with 128, and then VK5PAS and Adrian VK5FANA, both with 123. And rounding off the top 5 is Peter VK3TKK with 113 different references. And this year, we have no VK’s in the Top 44 in the World. Leading once again is Luciano I5FLN with 1,283 different references. At number 44 in the World is SM5BXC in Sweden, with 628 different references. And now the popularity of the VKFF program increasing, and more VKFF activators getting on to some of the DX bands such as 20m, quite a few Europeans appear in the top 44 list. I have created a new certificate for the VKFF program. It will be awarded to the Top VKFF Activator each year. I have forwarded the 2013 certificate to Joe VK3YSP, and the 2014 Top VKFF Activator certificate to John VK5BJE. Who will get the 2015 certificate? After reading a comment by Pit YO3JW re breaking down the WWFF stats by year, I decided to have a look at the build up of the WWFF program here in Australia, by looking at the 2013, 2014, & 2015 Activator statistics as they relate to Australia (this post only relates to Activators – I will look at the Hunter progress in another post). The World Wide Flora Fauna (WWFF) program commenced in Australia in March 2013. Here are some stats for that year. In 2013, in the Top 44 Activator classification (References), we had two Aussie representatives. They being Joe VK3YSP and Julie VK3FOWL. Joe reached number 26 on 25 references activated. And Julie was on number 31 with 21 references activated. I recall this year that Joe and Julie went on quite a big trip, activating National Parks all across Victoria. What a great effort, 25 unique WWFF reference areas in one year, and featuring in the Top 44 Activators worldwide. And below is a list of the Top VKFF Activators for 2013. There were 32 in total. On the top was Joe VK3YSP, followed by Julie VK3FOWL, John VK5BJE with 14 references for that year, Paul VK5PAS with 13, and Peter VK3ZPF rounded off the top 5 with 12 WWFF references for 2013. We then move on to 2014. WWFF has now been running for not quite 2 years in Australia. And in the Top 44 we have 2 different Australian hams. They being John VK5BJE at position number 26 in the World, with 38 different references activated in 2014. Tony VK3VTH is sitting in position number 41 with 27 different WWFF references. What a great effort by both John and Tony. The Top 44 VK list shows that the WWFF program has grown in Australia. The number of Australian activators has increased. In 2013 we had just 32 Australian amateurs provide their log for upload. Now e have over 44. Sitting on top now with 38 references for 2014 is of course, John VK5BJE. This is followed by Tony VK3VTH with 27 references, Nick VK3ANL with 24 references, Joe VK3YSP with 20, and Julie VK3FOWL with 19. It is very pleasing to see a number of Foundation calls in the list. It proves that operating portable, generally puts everyone, no matter what their licence class, on an equal playing field. And then on to 2015. WWFF in Australia is now just under 2 & 1/2 years old. So far, half way through the year, we have a total of five Australians in the Top 44 Activator List for References in the World. With 32 references, sitting in position 16, is yours truly, VK5PAS. Closely followed by Tony VK3VTH in position 20 in the World, on 30 different WWFF references. Then comes Peter VK3PF in position number 26 with 24 references. It is really pleasing to see a Foundation operator from Australia, holding down position 31. Doug VK2FMIA has a total of 23 WWFF references for 2015. And in position 41 is another Foundation call, Rob VK4FFAB, with a total of 17 different WWFF references for 2015. Both Doug and Rob certainly fly the flag for WWFF in their respective States. The Australian Activator list for 2015, shows Paul VK5PAS sitting on top with 32 unique references, closely followed by Tony VK3VTH with 30 references, then Peter VK3PF with 24. And then Doug VK2FMIA with 23 references, and Rob VK4FFAB with 17 references. So as Australian Activators, considering our population, we are doing extremely well. And the WWFF program in Australia is catching on in popularity, as I am sure will be evident by the next post, where I will have a look at the evolution of WWFF park hunting in Australia. And remember, that these stats are only representative of logs provided by Park Activators for upload to the WWFF LogSearch system. There has been a lot of other park activity, but sadly, for a variety of different reasons, those logs have never been provided for upload. So, please, if you activate a qualifying park for WWFF, please provide your log for upload. It is simply a matter of forwarding via email to VK5PAS, an ADIF file or a CSV file (template found on WWFF Australia website) and your log will be uploaded. Yesterday after having a chat with Tony VK3VTH on the phone, I had a look at the LogSearch platform for the World Wide Flora Fauna (WWFF) program. I was interested to see that Tony VK3VTH was in the Top 44 ACTVATORS in the WORLD. A great effort Tony, considering the number of hams we have down here, and how new the WWFF program is here in Australia. Tony is sitting on 70 WWFF references worked. And just outside the Top 44 Activators list are a few other Aussies. Peter VK3PF is just 1 off, sitting on 62 references, followed by John VK5BJE who is on 60 references. We all know how active Peter and John are in activating parks, not only in their own home States, but all across Australia. Well done Peter and John. 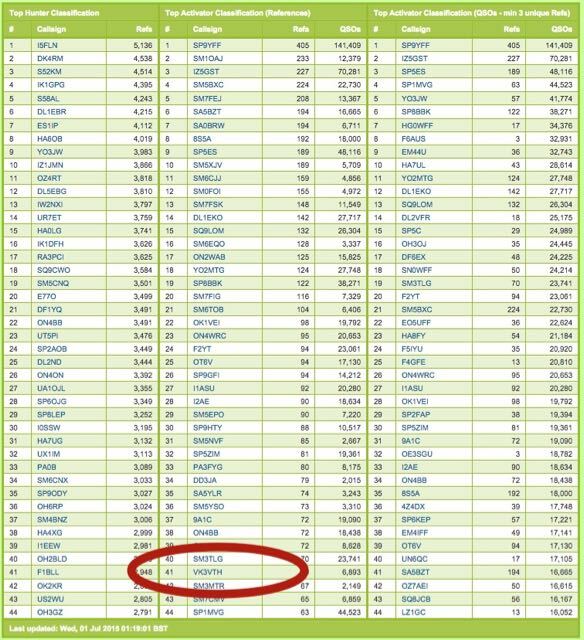 I then looked at the Top 44 ACTIVATOR list for AUSTRALIA. Of course, sitting on the top, was Tony VK3VTH on 70 different WWFF references, followed by Peter VK3PF on 62, John VK5BJE on 60, yours truly VK5PAS on 45, and Peter VK3ZPF on 42, rounding off the top 5. The top activator in the world by the way is SP9YFF in Poland, with an amazing 405 different WWFF activations. And in the Top 44, I see a lot of Foundation calls which is great. Julie VK3FOWL is sitting on 37 WWFF reference areas activated, Doug VK2FMIA is on 27 references, Rob VK4FFAB is on 17 references, Brett VK4FTWO is on 3 references, Amanda VK3FQSO is also on 3 references, Phillip VK2FPJR is on 2 references, and Alan VK5FAJS is also on 2 references. The WWFF LogSearch platform also shows the Top Activators as far as the number of QSOs. Again, sitting proudly at the top is Tony VK3VTH with 6,893 QSOs (the European park hunters love Tony), Johan PA3EXX with 5,426 QSOs (Johan has activated numerous rare Australian IOTA’s, thus the reason why he is on the Australian list), yours truly with 3,316 QSO’s, Peter VK3PF with 2,477 QSOs and Andrew VK1NAM, rounding off the top 5, with 2,107 QSOs. And finally I looked at the Top 44 Hunter list in AUSTRALIA. At the top of the list is Peter VK3PF with 209 different WWFF references, followed by myself with 186 references, Amanda VK3FQSO with 179, Peter VK3TKK with 153, and wrapping up the top 5 is Gerard VK2IO with 130 different WWFF references. It was also to see a number of European call signs in the Top 44 Hunter list for Australia, proving the popularity of the VKFF program. They include Luciano I5FLN in Italy, Max IK1GPG in Italy, Albert S58AL in Slovenia, Xaver DK4RM in Germany, Hink S52KM in Slovenia, Uwe DL2ND in Germany, and Axel DL1EBR, also in Germany. At this stage, we do not have any VK Hunters in the Top 44 Worldwide Hunter list. Number 44 there is OH3GZ with an amazing 2,791 different WWFF references. The top Hunter worldwide is Luciano I5FLN with a staggering 5,136 different WWFF references. So in just over 2 years that WWFF has been running in Australia, we have some very active WWFF Park Activators and Hunters. For more information on the World Wide Flora Fauna program, please have a look at the global website at…..
And the Australian (VKFF) website at…..
To access LogSearch, you first need to register (which is Free and Easy). LogSearch can be located at……. Check it out. You might just find you have some award certificates waiting there for you.